It's already mid-April, and we've seen some signs of spring while out exploring new haunts and returning to some old favorites. Henry had some one-on-one time with both Scott and I last weekend. Saturday I took him to Room and Board for one of their in-store events, celebrating Japanese culture and the Cherry Blossom Festival. We ate candy sushi, enjoyed storytime, bounced and climbed on bunk beds, and had an anime caricature done. After, we enjoyed "monster" pizzas together at &Pizza, which might have been his favorite part, after the bunk bed bouncing. 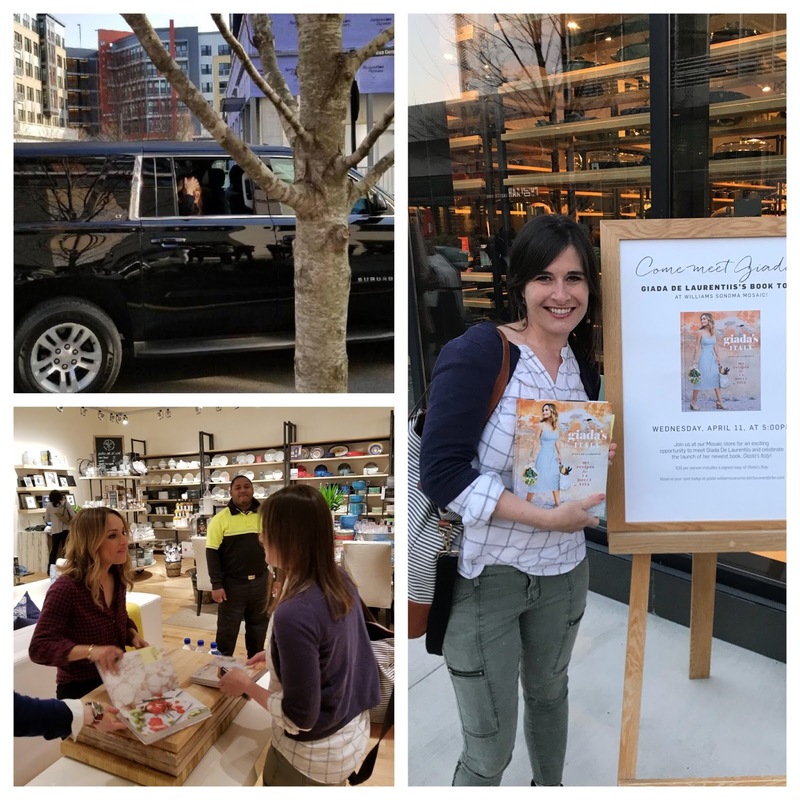 This last week I headed solo to Fairfax, Virginia, to meet one of my culinary inspirations, Giada DeLaurentis, at her book signing. She was about 40 minutes late and drove by the EPIC line with some embarrassment. In her defense, there was a ton of traffic considering the signing was on a weekday from 5-7pm. I waited two hours in line with lots of friendly people, and finally made it up, blubbered thanks for her recipes that I used for Easter, and it was over in a flash. As most brushes with celebrities are! During a two-day trend of warm weather days (40s on Monday, 80s on Friday and Saturday!) 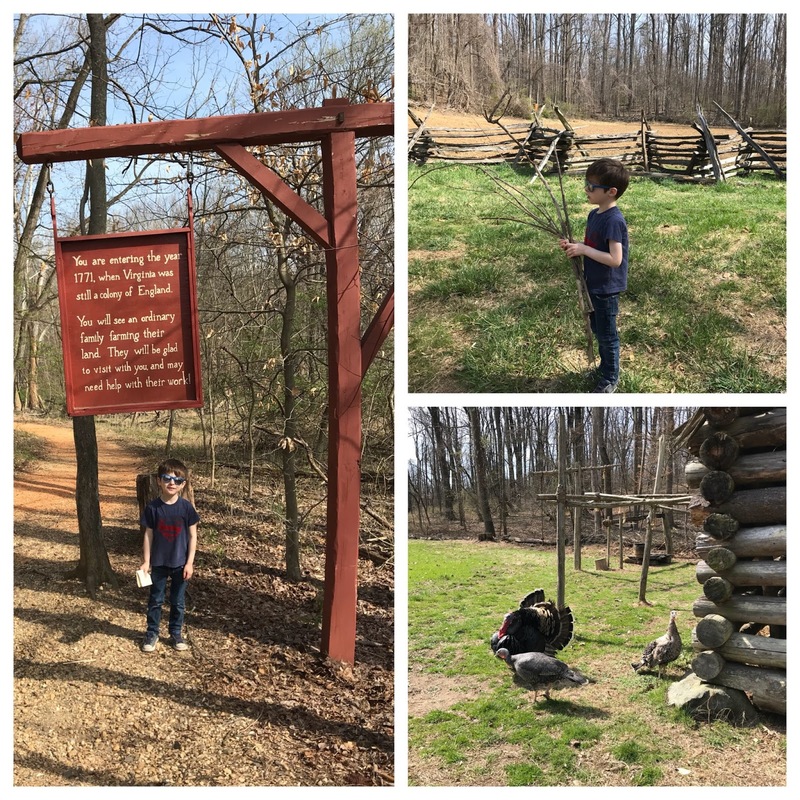 I took the kids to Claude Moore Farm, a living history farm and US National Park. Henry wasn't particularly thrilled at this idea of a morning out, but quickly changed his mind when told that picking up sticks for the fires was extremely helpful. I was also not sure what to expect out of the re-enactment actors (?) but it turns out, they were very friendly with varying levels of sticking to the script, which I found comical. One of the people we met was a tobacco farmer and the others, a mother/daughter duo, "Faith" and "Silence" who were tending to their home's 1,000 chores for the spring day. 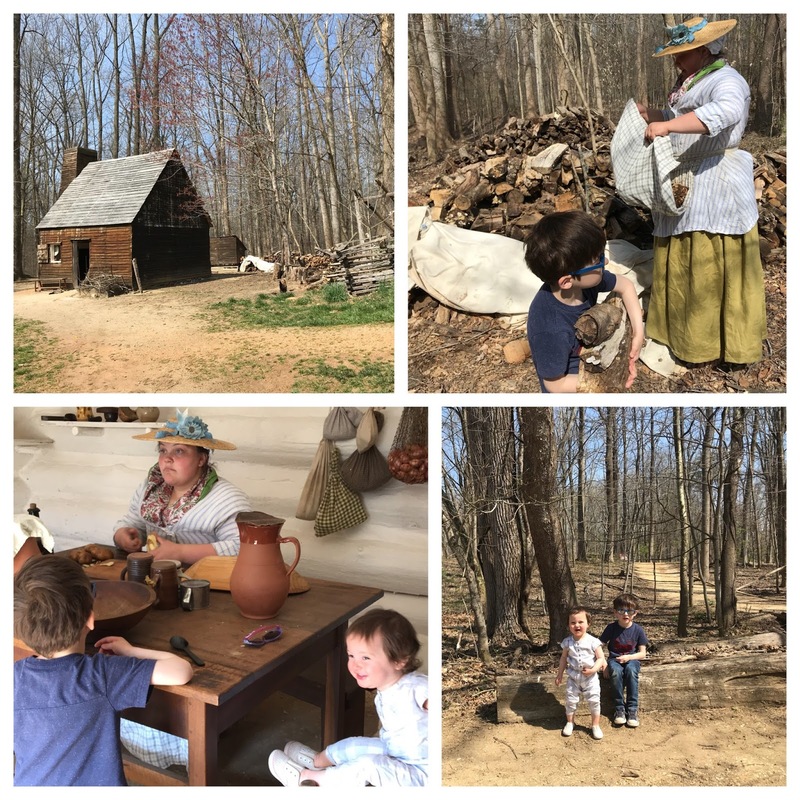 They encourage help and participation from modern-day civilians like hauling wood, finding their stored potatoes, sweeping, and pulling weeds. Henry is at that awesome age where he enjoys these activities with gusto, and had a field day. The mother and daughter did a great job talking to him about their historical lives and questioning his 21st century way of life. I think he's just beginning to understand the historical timeline, so it was pretty funny to watch. On our way home I made a spontaneous turn for a picnic lunch along the George Washington Memorial Parkway, one of my favorite drives, as it parallels the Potomac on the Virginia side, so you get a great view of DC. 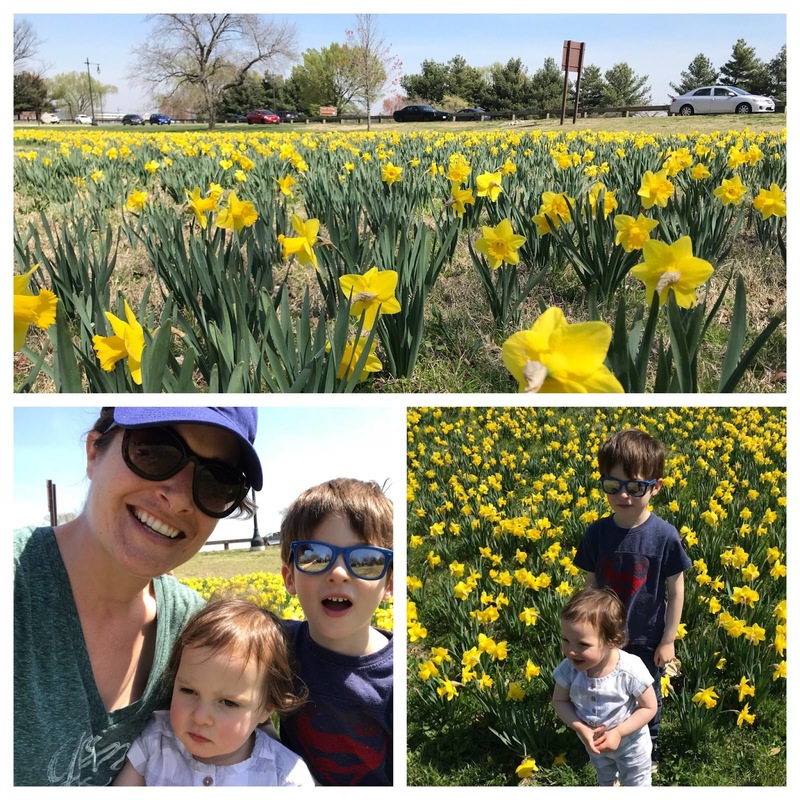 The daffodils are in full bloom everywhere, and this particular patch, near Dolly Madison park and a boat harbor, offered a great spot to enjoy the kids' lunch of peanut butter and honey sandwiches. 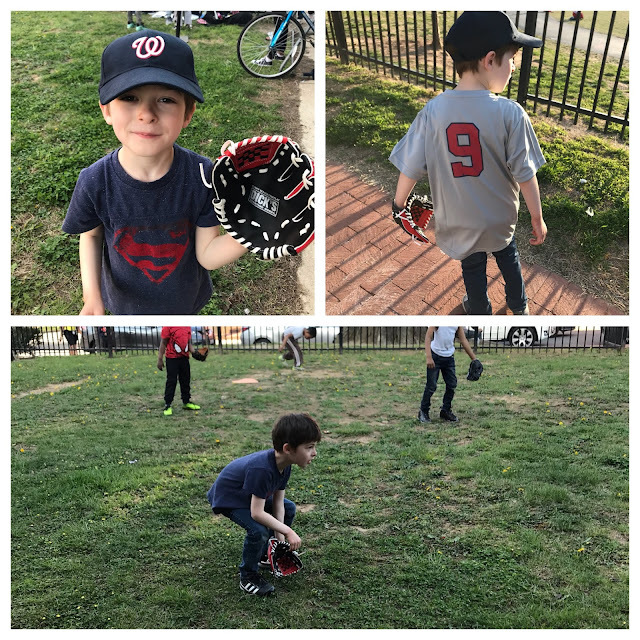 Henry has started his first season of t-ball and it's probably his most favorite thing next to Star Wars. He is confident and proud of every catch and hit and like most parents would say, it's a total joy to watch him on the field. Their first game is this week and I'm sure hilarity will ensue. After two wonderful days of spring, winter descended again and I gave it the finger and took Henry out to the Anacostia River Festival while Scott stayed home with a sick Josephine. 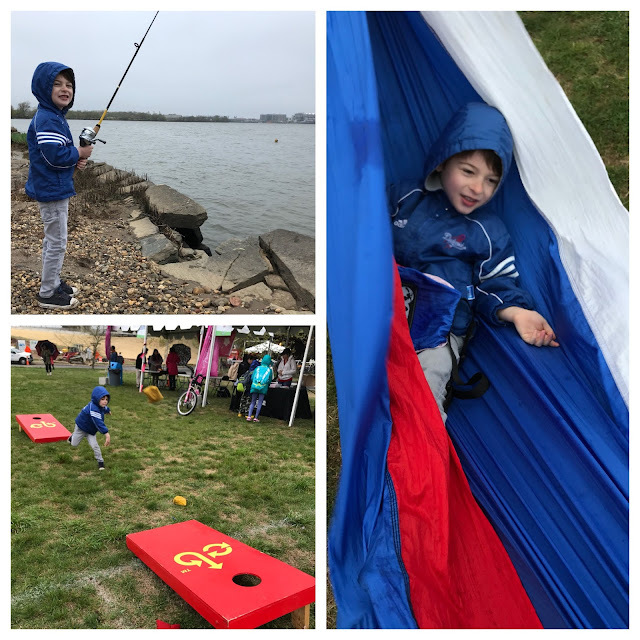 I think the cold, wet, and windy weather kept quite a few people home that day, so we had most all activities to ourselves. 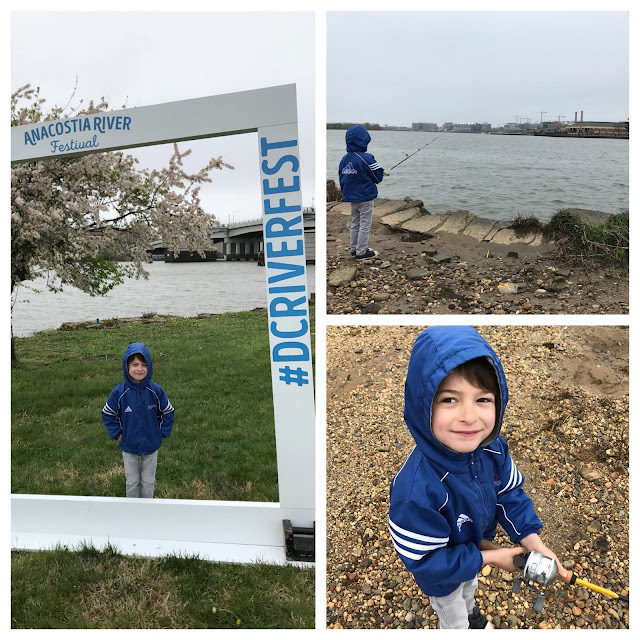 However, Henry's favorite was easily fishing. He comes from a long line of fisherman (hah, see what I did there?) on both sides of the family and I can assure them all, his cast is pretty darn good. We didn't catch anything, but he stood sentinel with frozen fingers and purple lips by the time we were done! The season is shaping up to be pretty great.